Why is workforce management software so important? There are a number of reasons why even projects with the very best intentions end up failing. Oftentimes, it's difficult to identify exactly where things got derailed and at what step the project went off track. Be it an unrealistic timeline, unrefined goals or a clear lack of organized leadership, everyone involved pays a hefty price when projects go awry. While project managers cannot control the weather or a high rate of turnover amongst workers, they MUST be able to control workflows and have the ability to communicate and delegate. Project+ was created to address these very needs. Businesses that employ a significant mobile workforce now have a central communications system where all information can be shared, reviewed and discussed. There are some universal obstacles that can threaten a project's success. Here are the ways Project+ will help you avoid those pitfalls. Waiting on a phone call from your tile installer while anticipating an email from your electrician? Productivity wanes and before you know it, you're another day behind schedule. Real-time information is not a luxury...it's a must-have. With group messaging on the Project+ platform, it couldn't be easier to exchange location information, ask and answer questions and ensure that jobs are being completed on time. Need to have a private conversation? Just direct message any member of the team. Nothing hurts a project more than the lack of a plan. Workers who don't know where they're supposed to be and are unaware of their daily, weekly and monthly tasks will wander and migrate in different directions – and seriously damage productivity. Trust your employees to manage their own time and approach in getting their tasks done and the will waste less time. Using Project+ to create checklists and assign workers to these tasks and actions keeps the team on point. 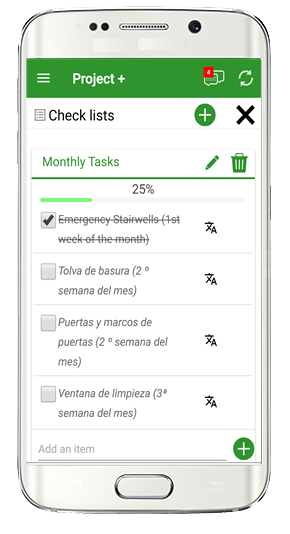 Each task can be designated, updated and checked off by members of any given team at any stage of the project. Push notifications are generated accordingly, ensuring everyone is on the same page. The constant barrage of phone calls, emails, texts and social media messaging are a major source of distraction in most people's everyday lives. On the jobsite, attempting to juggle an influx of information coming at you from all of these communication angles is not only a distraction – it's a potential disaster. Just a few missed calls or a couple of unanswered emails can set you back days, if not weeks. The importance of having one communications hub for all project activity cannot be understated. Project+ assures that not only does information get circulated properly, but there is also a record of each discussion. The ability to search message threads and access specific projects makes it easy and fast to get up to speed on any project. It's clear that communication – or the lack of it – can make or break a project. It's also a given that at every level of a project, workers of all nationalities will ultimately contribute to a project's successes and failures. Letting language barriers get in the way of productivity is simply not an option in today's world. 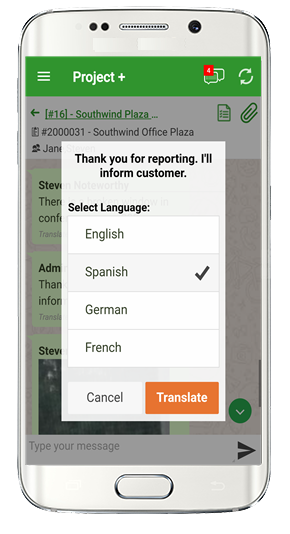 You don't have time to get online or call your co-worker that speaks three languages. So Project+ lets you instantly translate any message in the conversation thread. This option within every message bubble translates English, French, German and Spanish. A worker is texting with a peer across the jobsite; he's frustrated trying to describe specific elements of his building project, which appears to be missing some parts. Meanwhile, a manager across town is calling the home office, trying to communicate the circumstances of an equipment issue happening at the scene. Project+ provides a much more efficient way to share these important details. 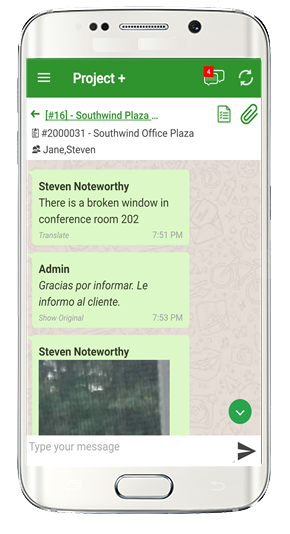 Workers can simply snap a photo on their mobile devices and upload it directly into team messaging, facilitating swifter and clearer communication. Project+ is integrated into Timesheet Mobile’s existing GPS-enabled timetracking app and is included in Punch Plan 1, 2 and 3 subscription plans.